Let’s talk about grocery shopping. There are so many strategies out there on the best ways to or not to do it, from running to the grocery store to pick up a few things as you need them to planning out two weeks worth of meals making a master list and trip. I’ve been on both ends of the spectrum and neither is particularly enjoyable. What is your current strategy? Do you plan it or wing it? And how often do you shop? I’ve been on both ends of the spectrum, but recently I’ve been scanning the weekly flyer for a couple local grocery stores to find out what is on sale and then loosely planning a weeks worth of meals around that. I’ll usually just hit one grocery store for the week, but it varies which one depending on which sales I like best. Being a bit more organized has helped us eat healthier and spend less money. Deciding when to shop has been the challenge recently. It seems the best times for me to go are Fridays after work or Saturday mornings. Of course that’s when everyone else shops and the checkout lines are a mile long. And taking a baby along slows down things even more, mostly because everyone notices his charming smile and stop to to talk 🙂 At least he is a good baby. What are your awesome grocery shopping tips and tricks? Recently, these Blackberry Crumb Bars have been a huge hit and have been going crazy on Facebook. 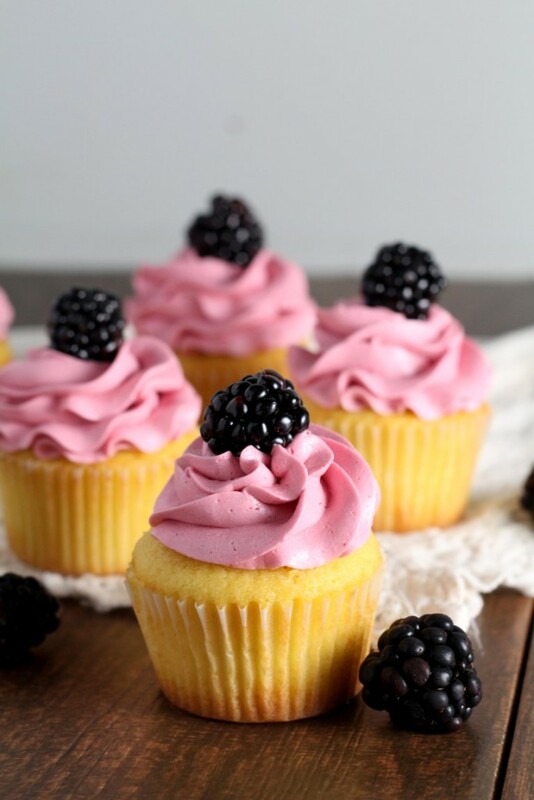 Before blackberry season ends, I wanted to create another recipe with them. They’re like candy this time of year. 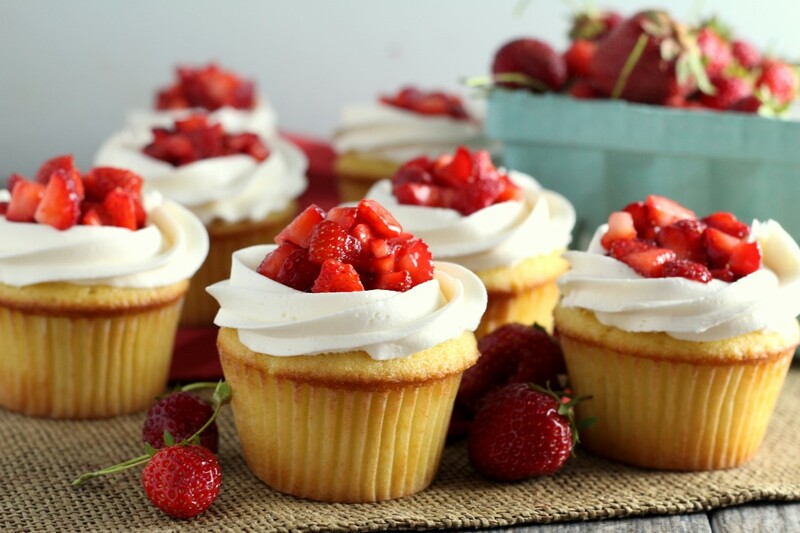 These cupcakes are a simple vanilla recipe and are topped with the best frosting of the summer. 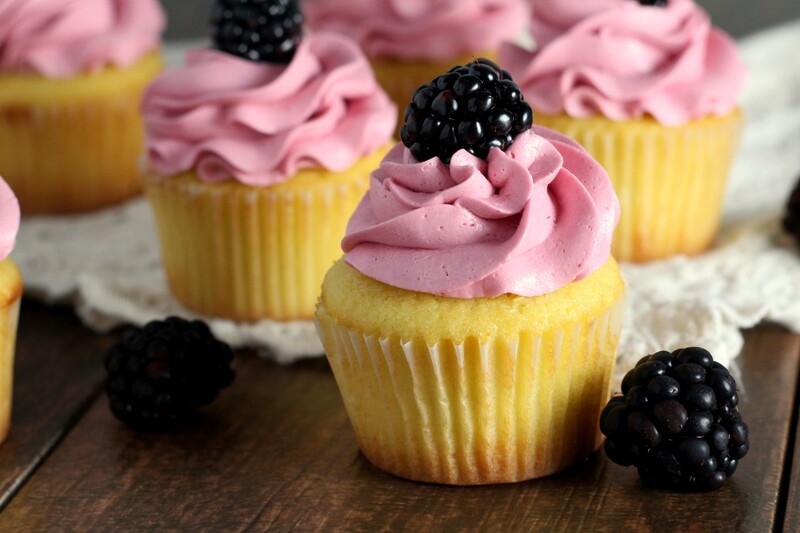 Tart fruits like blackberries go so well in sugary buttercreams. Preheat the oven to 350 F. Line 2 cupcakes pans with 24 cupcake papers. In a stand mixer, cream the butter and sugar on high for 2-3 minutes or until light colored and fluffy. Beat in the eggs one at a time. Beat in the vanilla. In a separate bowl, whisk together the flour and baking powder. Alternately add the dry ingredients to the wet ingredients with the milk in three parts, stirring just until combined and scraping down the sides as necessary. Spoon the batter into the lined cupcakes pan, dividing between all 24. Bake for 20-15 minutes or until a toothpick inserted comes out clean. Let cool for 5 minutes in the pan and then remove to a wire rack to cool completely. Beat the softened butter in a stand mixer for 2-3 minutes until light in color and fluffy. Beat in the powdered sugar, vanilla, blackberry reduction and enough of the heavy cream or milk to make a spreadable consistency. 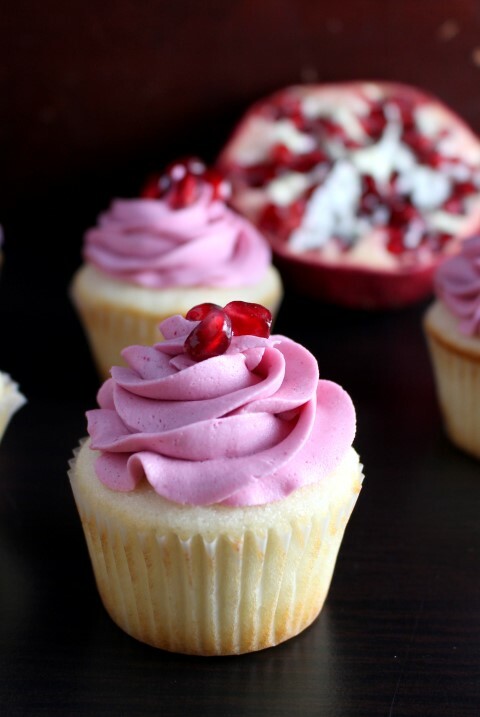 Beat the frosting on high for 3-4 minutes or until very fluffy. 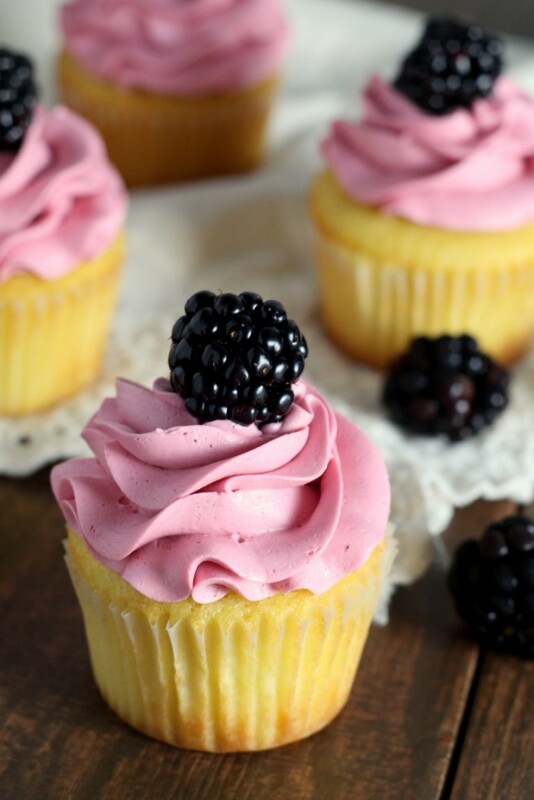 Pipe the frosting onto cooled cupcakes and garnish with a blackberry if desired. 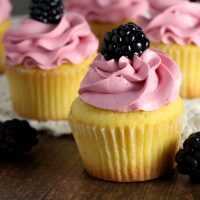 If you’re going to have a website called chocolate with grace why are you posting recipes with blackberries in them or vanilla cupcake recipes? Hi do you have uk measurements for these?